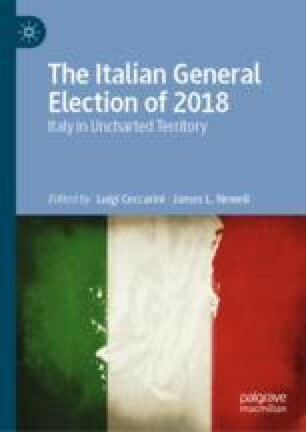 In contrast to previous Italian elections, the election of 2018 was one in which foreign policy-related issues were significant in the campaign and had a large impact on the outcome. In particular, while Italian citizens had in the past been mostly very supportive of the EU external constraint, these elections seemed to epitomise the end of the permissive consensus towards European integration on the part of Italian public opinion. However, although the international context had significant implications for the 2018 election, this chapter argues that there was nothing inevitable or ‘automatic’ about them. In fact, the effects of the Eurozone and the migration and refugee crises arose from an interaction between: the crises themselves; the asymmetries characterising EU responses to them; Italy’s structural features, particularly its large public debt and its weak banking system; and normative factors, such as citizens’ growing disillusionment with the country’s political institutions, and widespread fears of immigration. Alfieri, M. 2018. Elezioni, perché la ripresa economica non sarà decisiva per il voto. Il Sole 24 Ore, February 28. http://www.ilsole24ore.com/art/commenti-e-idee/2018-02-27/elezioni-perche-ripresa-economica-non-sara-decisiva-il-voto-221233.shtml?uuid=AECUVI7D. Bassi, A. 2013. Grillonomics, i salvataggi li paghi Berlino e la Bce stampi moneta. Via Imu e bolli dai conti correnti. La relazione al Def dei grillini. Huffpost, May 3. https://www.huffingtonpost.it/2013/05/02/grillonomics-i-salvataggi-li-paghi-berlino-e-la-bce-stampi-moneta-via-imu-e-bolli-dai-conti-correnti_n_3199372.html. BBC. 2014. Profile: Enrico Letta. February 13. https://www.bbc.com/news/world-europe-22285883. Berry, M., I. Garcia Blanco, and K. Moore. 2016. Press Coverage of the Refugee and Migrant Crisis in the EU: A Content Analysis of Five European Countries. UNHCR. http://www.unhcr.org/protection/operations/56bb369c9/press-coverage-refugee-migrant-crisis-eu-content-analysis-five-european.html. Bratti, M., C. Deiana, E. Havari, G. Mazzarella, and E. Meroni. 2017. What Are You Voting for? Refugee Reception Centres and Voting at the 2016 Italian Constitutional Referendum. IZA—Institute of Labor Economics, September. http://ftp.iza.org/dp11060.pdf. Caneva, E. 2014. The Integration of Migrants in Italy: An Overview of Policy Instruments and Actors. INTERACT, Research Report 2014/05. http://cadmus.eui.eu/bitstream/handle/1814/32019/INTERACT-RR-2014_05.pdf. Carrera, S., L. den Hertog, and J. Parkin. 2012. EU Migration Policy in the Wake of the Arab Spring: What Prospects for EU-Southern Mediterranean Relations? MEDPRO, Technical Report No. 15. https://www.ceps.eu/system/files/MEDPRO%20TR%2015%20EU%20Migration%20Policy%20in%20wake%20of%20Arab%20Spring.pdf. Corriere della Sera. 2013. Forza Italia esce dalla maggioranza Alfano: “Un errore sabotare Letta”. November 26. https://www.corriere.it/politica/13_novembre_26/questa-legge-stabilita-poltrone-40b87926-569a-11e3-9a32-8b8b5da15961.shtml. Cusumano, E. 2017. Straightjacketing Migrant Rescuers? The Code of Conduct on Maritime NGOs. Mediterranean Politics. https://doi.org/10.1080/13629395.2017.1381400. ———. 2018. Migrant Rescue as Organized Hypocrisy: EU Maritime Missions Offshore Libya Between Humanitarianism and Border Control. Cooperation and Conflict, pp. 1–22. https://doi.org/10.1177/0010836718780175. Debomy, D., E. Rivère, and A. Husson. 2018. The Italians and Europe, Chronicle of Disenchantment. Jacques Delors Institute, Policy Paper No. 217. http://institutdelors.eu/publications/the-itaians-and-europe-chronicle-of-disenchantment/?lang = en. Dehousse, R. 2013. Europe at the Polls: Lessons from the 2013 Italian Elections. Notre Europe Jacques Delors Institute Policy Paper. https://hal-sciencespo.archives-ouvertes.fr/hal-01024858/document. Dennison, J., A. Geddes, and M. Goodwin. 2018. Why Immigration Has the Potential to Upend the Italian Election. LSE EUROPP Blog, January 17. http://eprints.lse.ac.uk/88403/1/europpblog-2018-01-17-why-immigration-has-the-potential-to-upend-the.pdf. Desideri, E. 2018. Eurosceptic or Europhile? Shedding Light on the Five Star Movement’s Stance Towards the EU. Open Europe, April 5. https://openeurope.org.uk/today/blog/eurosceptic-or-europhile-shedding-light-on-the-five-star-movements-stance-towards-the-eu/. Deutsche Welle (DW). 2018. Matteo Salvini: Italy’s Far-Right Success Story. March 5. http://www.dw.com/en/matteo-salvini-italys-far-right-success-story/a-42830366. Dinmore, G., and R. Sanderson. 2014. Italy Launches Big Privatization Push. Financial Times, January 26. https://www.ft.com/content/4466b51a-869c-11e3-aa31-00144feab7de. European Commission. 2013. Communication from the Commission to the European Parliament and the Council on the Work of the Task Force Mediterranean. Brussels, December 4. https://eur-lex.europa.eu/legal-content/EN/TXT/PDF/?uri=CELEX:52013DC0869&from=EN. ———. 2015a. A European Agenda on Migration. Brussels, May 13. https://ec.europa.eu/anti-trafficking/sites/antitrafficking/files/communication_on_the_european_agenda_on_migration_en.pdf. ———. 2015b. The Hotspot Approach to Managing Exceptional Migratory Flows. Brussels, September 11. https://ec.europa.eu/home-affairs/sites/homeaffairs/files/what-we-do/policies/european-agenda-migration/background-information/docs/2_hotspots_en.pdf. ———. 2016a. Managing the Refugee Crisis: State of Play and Future Actions. Brussels, January. https://ec.europa.eu/home-affairs/sites/homeaffairs/files/what-we-do/policies/european-agenda-migration/background-information/docs/eam_state_of_play_and_future_actions_20160113_en.pdf. ———. 2016b. Relocation and Resettlement—State of Play. Brussels, December 6. https://ec.europa.eu/home-affairs/sites/homeaffairs/files/what-we-do/policies/european-agenda-migration/background-information/docs/20161208/update_of_the_factsheet_on_relocation_and_resettlement_en.pdf. ———. 2018. Bank Recovery and Resolution. https://ec.europa.eu/info/business-economy-euro/banking-and-finance/financial-supervision-and-risk-management/managing-risks-banks-and-financial-institutions/bank-recovery-and-resolution_en. European Council. 2013. Conclusions. Brussels, October 25. http://data.consilium.europa.eu/doc/document/ST-169-2013-INIT/en/pdf. ———. 2017. Malta Declaration by the Members of the European Council on the External Aspects of Migration: Addressing the Central Mediterranean Route. Brussels, February 3. http://www.consilium.europa.eu/en/press/press-releases/2017/02/03/malta-declaration/pdf. European Court of Human Rights (ECHR). 2012. Case of Hirsi Jamaa and Others v. Italy. Strasbourg, February 23. https://hudoc.echr.coe.int/app/conversion/pdf/?library=ECHR&id=001-109231&filename=001-109231.pdf. Fabbrini, S. 2018. La nuova divisione che s’aggira per l’Europa. Il Sole 24 Ore, March 31. http://www.ilsole24ore.com/art/commenti-e-idee/2018-03-31/la-nuova-divisione-che-s-aggira-l-europa-222108.shtml?uuid=AEuzc4QE&refresh_ce=1. Forza Italia (FI). 2014. Le nostre idee per un programma per l’Europa. Leader, candidati e programma vincenti. http://www.ilmattinale.it/wp-content/uploads/2014/05/1811.pdf. Forza Italia (FI), Lega, Fratelli d’Italia (FdI), and Noi con l’Italia. 2018. Programma elettorale. Elezioni politiche 4 marzo 2018. https://www.money.it/IMG/pdf/progrtamma-centrodestra.pdf. Fratelli d’Italia (FdI). 2014. Il Programma di Fdi-An per le Elezioni Europee 2014. http://www.fratelli-italia.it/programma-europa/. Frontex. 2014. Africa-Frontex Intelligence Community Joint Report. October. http://www.statewatch.org/news/2014/dec/eu-africa-frontex-intell-report-2014.pdf. Galeazzi, L. 2014. Immigrati, manifestazione della Lega Nord a Ventimiglia. Il Fatto quotidiano, April 4. https://www.ilfattoquotidiano.it/2011/04/04/immigrati-manifestazione-della-lega-nord-a-ventimiglia/102028/. Italian Presidency. 2014. Programme of the Italian Presidency of the Council of the European Union. http://italia2014.eu/en/presidency-and-eu/programme-and-priorities/programme-of-the-italian-presidency-of-the-council-of-the-european-union/. La Mattina, A. 2018. Via libera alla missione in Niger, centrodestra spaccato sul voto. La Stampa, January 18. http://www.lastampa.it/2018/01/18/italia/via-libera-alla-missione-in-niger-centrodestra-spaccato-sul-voto-FqNdNEYfq4CCM7mck15TmJ/pagina.html. Lega Nord. 2014. Elezioni Europee 25 Maggio 2014. Programma Elettorale. https://www.leganord.org/phocadownload/elezioni/europee/Programma%20elettorale%20europee%202014.pdf. Lehne, S. 2016. Upgrading the EU’s Migration Partnerships. Carnegie Europe, November 21. https://carnegieeurope.eu/2016/11/21/upgrading-eu-s-migration-partnerships-pub-66209. Maggini, N. 2016. Il referendum e la dimensione europea. CISE, November 18. https://cise.luiss.it/cise/2016/11/18/il-referendum-e-la-dimensione-europea/. McBride, J. 2018. What to Know About Italy’s 2018 Elections. Council on Foreign Relations, February 14. https://www.cfr.org/backgrounder/what-know-about-italys-2018-elections. Ministero degli Esteri. 2011. FOCUS-LIBIA: L’Italia lavora al riconoscimento internazionale del CNT. April 19. https://www.esteri.it/mae/it/sala_stampa/archivionotizie/approfondimenti/2011/04/20110419_italia_cnt.html. Ministero dell’Interno. 2015. Report on the Reception of Migrants and Refugees in Italy: Aspects, Procedures, Problems. October. http://www.libertaciviliimmigrazione.dlci.interno.gov.it/sites/default/files/allegati/rapporto_accoglienza_eng_isbn_appendice_rev3b.pdf. Mortera-Martinez, C., and R. Korteweg. 2015. Dead in the Water: Fixing the EU’s Failed Approach to Mediterranean Migrants. Centre for European Reform, April 23. https://www.cer.eu/insights/dead-water-fixing-eu%E2%80%99s-failed-approach-mediterranean-migrants. Movimento Cinque Stelle (M5s). 2014. Europa in sette punti. http://www.menfi5stelle.it/documenti/Locadina%20Sette%20Punti%20A4.pdf. ———. 2018. Stop al business dell’immmigrazione. https://www.movimento5stelle.it/programma/immigrazione.html. Paoletti, E. 2012. Migration Agreements Between Italy and North Africa: Domestic Imperatives Versus International Norms. Middle East Institute, December 19. http://ffm-online.org/wp-content/uploads/2013/03/Migration-Agreements-between-Italy-and-North-Africa.pdf. Paparo, A. 2016. Renzi e il suo governo: la popolarità persa e mai ritrovata. CISE, December 6. https://cise.luiss.it/cise/2016/12/06/renzi-e-il-suo-governo-la-popolarita/. Paravicini, G. 2018. 4 Ways the EU Let Italy Get Away with Murder. Politico, February 26. https://www.politico.eu/article/eu-let-italy-away-with-murder/. Partito Democratico (PD). 2014. L’Europa cambia verso. https://s3.amazonaws.com/PDS3/allegati/programma%20pd%20europa_DEF_Layout%201_1.pdf. Pascouau, Y. 2012. Schengen and Solidarity: The Fragile Balance Between Mutual Trust and Mistrust. Notre Europe, Policy Paper No. 55. http://institutdelors.eu/wp-content/uploads/2018/01/schengen_solidarity_y.pascouau_ne-epc_july2012.pdf. Piscioneri, F., and G. Baczynska. 2016. Italy Drops Objections to EU Migration Fund to Turkey. Reuters, February 1. https://uk.reuters.com/article/uk-europe-migrants-turkey-italy/italy-drops-objections-to-eu-migration-fund-to-turkey-idUKKCN0VA30K. Reuters. 2013a. EU Gives Support to Italy’s Letta, Cautions on Debt. May 2. https://www.reuters.com/article/eu-italy-idUSL6N0DI2F120130501. ———. 2013b. Italy’s Coalition Government in Crisis After Berlusconi Ministers Announce Resignations. September 28. https://www.thestar.com/news/world/2013/09/28/italys_coalition_government_in_crisis_after_berlusconi_ministers_announce_resignations.ht. ———. 2017a. Italy Will Respect EU Budget Rules but Not Risk Depressing Economy: PM Gentiloni. January 27. https://www.reuters.com/article/us-eurozone-italy/italy-will-respect-eu-budget-rules-but-not-risk-depressing-economy-pm-gentiloni-idUSKBN15B1ZK. ———. 2017b. Italy Hikes Taxes to Rein in 2017 Budget Deficit. April 24. https://www.reuters.com/article/us-italy-budget-idUSKBN17Q22S. ———. 2017c. Italy Tries Europe’s Patience with Fumbled Veneto Banks’ Rescue. June 22. https://www.reuters.com/article/eurozone-banks-italy-intesa/italy-tries-europes-patience-with-fumbled-veneto-banks-rescue-idUSL8N1JJ3ES. ———. 2017d. EU Says Concerned Over Italy’s 2018 Budget, Adding to Government’s Woes. October 27. https://www.reuters.com/article/us-italy-budget-eu/eu-says-concerned-over-italys-2018-budget-adding-to-governments-woes-idUSKBN1CW2HN. ———. 2018. ELEZIONI 2018-Berlusconi: Italia non può fare a meno di euro, dubbi Lega. January 9. https://it.reuters.com/article/itEuroRpt/idITL8N1P441Q. Romei, V. 2018. Italy’s Election: Charts Show How Economic Woes Fuelled Five Star. Financial Times, March 7. https://www.ft.com/content/175d55b8-20a0-11e8-a895-1ba1f72c2c11. Saviano, C. 2018. Ultimi sondaggi: gli effetti del raid di Macerata sulle intenzioni di voto. la Repubblica, February 10. http://www.repubblica.it/politica/2018/02/10/news/ultimi_sondaggi_gli_effetti_del_raid_di_macerata_sulle_intenzioni_di_voto-188527606/?refresh_ce. Scherer, S. and G. Baczynska. 2017. Italy Pleads to EU for Help with Migrants, Threatens to Close Ports. Reuters, June 28. https://www.reuters.com/article/us-europe-migrants-italy/italy-pleads-to-eu-for-help-with-migrants-threatens-to-close-ports-idUSKBN19J28U. Tamma, P. 2017a. Migrants: 87% Drop in Arrivals in August, UN Warns of Risks to Refugees. Euractiv, August 31. https://www.euractiv.com/section/justice-home-affairs/news/migrants-87-drop-in-arrivals-in-august-the-un-warns-of-risks-to-refugees/. ———. 2017b. Italy Seeks EU’s Help on Migration. Euractiv, October 20. https://www.euractiv.com/section/global-europe/news/italy-seeks-eus-help-on-migration/. Tucci, C. 2011. Maroni: a Lampedusa è emergenza umanitaria. Impensabile che l’Europa stia solo a guardare. Il Sole 24 Ore, February 16. http://www.ilsole24ore.com/art/notizie/2011-02-16/maroni-lampedusa-emergenza-umanitaria-160307.shtml. United Nations High Commissioner for Refugees (UNHCR). 2011. Hundreds of New Arrivals in Italy from Libya and Tunisia. August 16. http://www.unhcr.org/news/briefing/2011/8/4e4a505f9/hundreds-new-arrivals-italy-libya-tunisia.html. ———. 2018. Operational Portal: Refugee Situations. https://data2.unhcr.org/en/situations/mediterranean/location/5205. Ursu, A.E. 2018. Nothing New Under the Sahelian Sun. Clingendael, January 15. https://www.clingendael.org/publication/italian-military-deployment#.